This Sunday – April 7th @ 1 p.m.
Town of Thompson One Room Schools, A PowerPoint presentation by Gordon MacAdam of Mongaup Valley will be held at the Time and the Valleys Museum on St. Rt. 55 in Grahamsville, Sullivan County on Sunday, April 7th at 1 p.m..
A committee including Gordon MacAdam and Paul Lounsbury of Grahamsville has been working for two and a half years on a project to research twenty one room schools in the town of Thompson and place historical plaques at each school. A book compiling all this research will be published near the end of 2019. The program is free for Museum members and $5 for non-members, which includes light refreshments and Museum admission. Photos documents and other materials from the Museum’s archives on local one room schools will also be on display. 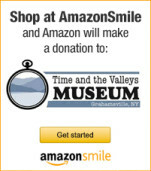 For more information email info@timeandthevalleysmuseum.org, call 845 985-7700 or go to: www.timeandthevalleysmuseum.org.